The Embassy of the Republic of Fiji in Tokyo successfully commissioned Mr. Hiroki Miura as Fiji’s Honorary Consul in Akita on Saturday, 1st September 2018. Mr. Miura’s appointment will cover the Tohoku Consular District, which consists of six large prefectures in North-East of Japan. Fiji’s Ambassador to Japan, H.E Mataitoga presenting the Consular Commission to Mr. Miura, formalizing his appointment as Fiji’s Honorary Consul in Akita, while Mrs. Miura looks on. 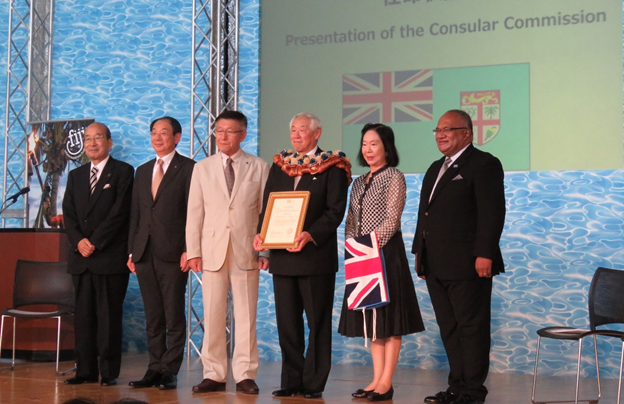 The ceremony was marked by the official presentation of the Consular Commission – signed by the Hon. 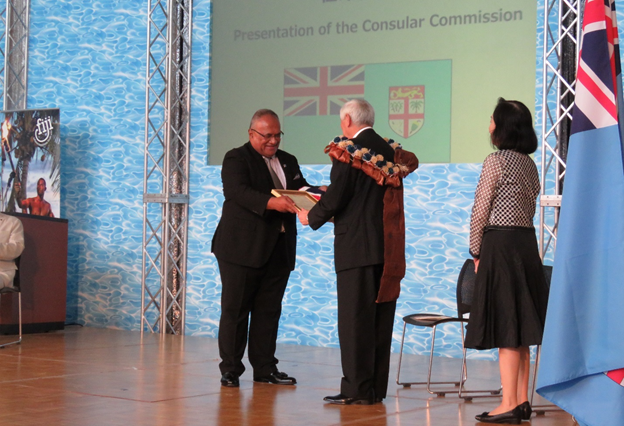 Josaia V. Bainimarama, Prime Minister and Minister for Foreign Affairs – by Fiji’s Ambassador to Japan, His Excellency Ambassador Mr. Isikeli Mataitoga to the newly commissioned Mr. Miura. The commissioning ceremony was held at the ALVE Akita before 250 guests that included the Honorable Members of the Diet, Governor of Akita Prefecture, Mayor of Akita City, Councilors of respective towns and cities in Akita and the Tohoku region. Attending the occasion were also members of the business community, representatives of NGOs as well as academia. Also witnessing the event were the members of the Nasinu Secondary School Under 15 Rugby Team, which is currently in Akita for a week of rugby and cultural exchanges with the Akita City and schools. In congratulating Mr. Miura on behalf of the Government of Fiji, Ambassador Mataitoga expressed profound gratitude for his willingness to assist Fiji in building and strengthening the Fiji-Japan relationship in the Tohoku region. H.E Mataitoga also underscored Fiji’s long-standing emphasis and work in establishing and maintaining friendly relations with partners who have demonstrated genuine goodwill towards Fiji. And the growing bond between Fiji and Akita in recent times necessitated the establishment of this new Honorary Consulate appointment. It is also a reflection of the goodwill enjoyed between Japan and Fiji since 1970 in promoting economic, commercial and people-to-people relations between the two countries. L-R: Mr. Ochida (Chairman Akita Rugby Union), Mr. Motomu HOZUMI (Akita City Mayor), H.E Mr.Norihisa SATAKE (Governor – Akita Prefecture), Mr Hiroki Miura (Fiji’s Honorary Consul in Akita), Mrs.Miura, and H.E Ambassador Mataitoga, after the presentation of the Consular Commission. With the establishment of the new Honorary Consulate in Akita, Ambassador Mataitoga is confident that this will lay the platform for Fiji to deepen its reach in promoting tourism, trade, and investment in the greater Tohoku region. The Fiji Embassy in Japan is confident that the presence of the Honorary Consulate will encourage, support and translate business/investment opportunities into tangible benefits for Fiji and Japan. 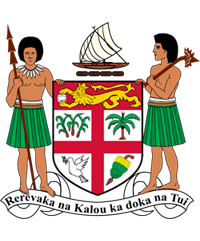 The office will also be an excellent point of information dissemination about Fiji. Speaker of Parliament, the Hon.Dr.Jiko Luveni led a high-level delegation from Fiji that visited Japan during the month, to attend the 3rd Meeting of the Asia-Pacific Parliamentary Forum on Global Health Forum held from 23-25 August, 2017 in Tokyo. Members of the delegation included the Health Minister, Hon.Rosy Akbar and Member of Parliament, the Hon.Anare Vadei. The Forum on Global Health provides a platform for parliamentarians from 30 countries to exchange ideas in promoting action for achieving health targets under the Sustainable Development Goals (2030 SDGs), particularly through accelerating actions in priority issues like NCDs and healthy ageing.